Looking at Felix Gaballo of Malabon, Philippines standing with his son, Felix Jr., you cannot help but notice the resemblance. The nose, the mouth, the eyes, Felix Jr. is the spitting image of his father. But Felix Sr. hopes this is where the similarities end. 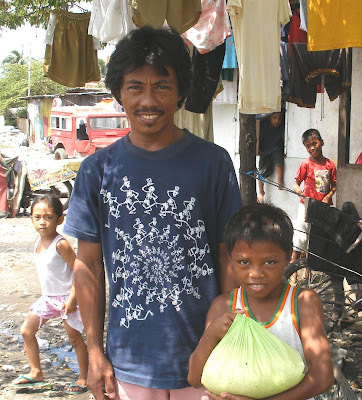 Forced to drop out of school when he was just fourteen years old to find a job, Felix Sr. encourages his son to go to school, to graduate and to break the cycle of poverty. "Education is very important if we want to improve our situation," explains Felix Sr. "I didn't finish my studies; that's why we're poor." He then looks at his son. "If I finished my studies, we wouldn't be experiencing hardships right now," he says. For this reason Felix Sr. looked to FH for help. Providing Felix Jr. with school supplies and financial assistance for tuition, FH's Child Development Program is transforming Felix Jr.'s life and family by making graduation from high school a real possibility. The Child Development Program sponsors fun activities like camping trips, field days, Bible studies, and health fairs to help meet all of Felix Jr.'s needs. Despite all FH has done to provide Felix Jr. with a chance at a better life, many problems still plague the family. With oil prices soaring worldwide, including the Philippines, Felix Sr. can no longer work as a gasoline tricycle driver, and as a cashier at a billiards hall, he earns only 100 pesos, or about $2.50, a day. Due to his meager income, his family also relies on his wife who works as a labandera, or laundry woman, and his eldest son who works in a factory. Furthermore, with ten children and food prices soaring throughout the Philippines, the task of simply feeding everyone on such a small income has become monumental. Most days, the family only eats twice a day, stretching a meager one and a half kilograms of rice to feed everyone. The children, including Felix Jr., are often malnourished and underweight. "Felix Jr. is not growing properly," explains Felix Sr., "because he is not eating right." Living in the flood prone Malabon, means the rainy season brings even more challenges, challenges like dealing with unsanitary living conditions induced by frequent floodings. The constant water damage to their home has left it close to ruin. "Our house needs repair," says Felix Sr., "[but] the money we're earning is only enough for food. I'm worried that the house will collapse on us soon." Unfortunately, this difficulty in feeding everyone and providing safe shelter has resulted in the sacrificing of education. With only three of the ten children studying, one being Felix Jr., the family has been forced to mortgage the future of their children to meet their needs today. Even Felix Jr. has had to put food above education. "Sometimes Junior gets scrap metal," Felix Sr. explains. In order to earn more money to supplement the family's income, Felix Jr. scavenges for scrap metal in the streets. Sometimes staying out all night collecting scrap metal, Felix Jr. can go to school at most three times a week due to exhaustion and hunger. As a result his academics have suffered greatly. And in a country where a job in a fast food restaurant usually requires a four year degree, failure in school is not an option for those hoping to get out of poverty. But there is hope for Felix Jr. and the Gaballo family. FH is helping them. Providing financial and material assistance, as well as moral and spiritual support, FH is working hard to allow Felix Jr. to pull himself and his family out of poverty. But for the almost 3,000 families living in their neighborhood FH cannot yet afford to help, facing the same struggles, more must be done.